1875 Born 11 August in Haddington, Scotland. Father was John Leader Nobbs of St. Petersburg, Russia. Mother was the former Agnes Fletcher Brown, daughter of the Reverend Dr. John Brown of Haddington. 1885 Attended classes at the School of Design, St. Petersburg. 1887 Entered the Edinburgh Collegiate School. 1889 Began attending classes in drawing, modelling, and design at Heriot Watt College. Also took classes in drawing and technical subjects at the School of Art and the School of Applied Art until 1896. 1896 Received an M.A. in Arts from the University of Edinburgh. Attended coronation celebrations of Czar Nicholas II. Became an articled pupil of Robert Lorimer. 1900 Awarded the Tite Prize of the Royal Institute of British Architects. Elected an Associate of the Royal Institute of British Architects. Embarked on a six-month trip to the Continent, spending several months in northern Italy. 1901 Moved to London. Joined the London County Council Architect's Department, Fire Brigade Branch. 1902 Submitted winning design for the Owen Jones Studentship of the Royal Institute of British Architects. Became chief assistant to A. Hessell Tiltman. 1903 Worked as a competition draughtsman in various offices in London, including those of John Belcher and Walter Tapper. Appointed Macdonald Professor of Architecture, McGill University. Moved to Montreal. 1904 Formed a temporary summer association with Montreal architect David R. Brown. 1905 Appealed for the establishment of a Museum of Industrial Art to improve Canadian products. 1906 Chaired Committee on City Improvement of the Province of Quebec Association of Architects. 1907 Carried out final revision of the design for the Alberta Legislative Building, Edmonton. 1908 Awarded a silver medal for an international foils display at the Olympic Games in London. 1909 Married Mary Cecilia Shepherd. Submitted resignation as Macdonald Professor of Architecture. Elected an Associate of the Royal Canadian Academy. 1910 Formed a partnership with George Taylor Hyde. Elected a Fellow of the Royal Institute of British Architects. 1911 Began appointment as Professor of Design at McGill. 1912 Travelled to Edmonton, Alberta, with Frank Darling. 1914-19 War service. Attained the rank of major. 1919 Won competition for a War Memorial Museum for Regina, Saskatchewan (unexecuted). 1920 Appointed architectural adviser to the Canadian Battlefields Memorials Commission. Elected an Academician, Royal Canadian Academy. 1924 Elected president of the Province of Quebec Association of Architects. 1928 Elected president of the Town Planning Institute of Canada. 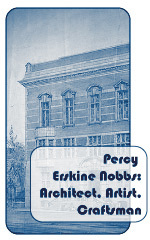 1929 Elected president of the Royal Architectural Institute of Canada. 1930 Served as vice-president of the Montreal City Improvement League and as chairman of the C.I.L. Committee on Town Planning. 1934 Served as joint-chairman of the Montreal Committee on Housing and Slum Clearance. Published Salmon Tactics. 1937 Published Design: A Treatise on the Discovery of Form. 1939 Elected to the Royal Society of Arts, London. 1941 Served as one of McGill's delegates to the Montreal City Council. 1942 Elected acting president of the Royal Canadian Academy. 1944 Death of George Hyde. Last designs of Nobbs and Hyde were executed in 1945, after which Nobbs practiced briefly under the name of Nobbs and Valentine and then in partnership with his son Francis J. Nobbs. 1948 Founded the Atlantic Salmon Association. 1952 Awarded the Outdoor Life Conservation Award. 1957 Awarded honorary degree of Doctor of Letters by McGill. 1964 Died 5 November. Buried in Mount Royal Cemetery, Montreal.